Huawei is making serious progress with its chipmaking business, coming up with more impressive in-house processors for its smartphones each year. The one that's en vogue for 2015 is the Kirin 930, an eight-core monster that's built on a 16nm process. Previously, the available information suggested that the K930 is based on stock ARM Cortex A53 and Cortex A57 cores, with the most recent reports surprisingly revealing an all-Cortex A53 octa-core configuration at the helm. Predictably, some questioning ensued, as the A53 cores are low powered and play second fiddle to the hotter A57 cores in the typical octa-core configuration. However, Huawei chimed in with an interesting explanation. 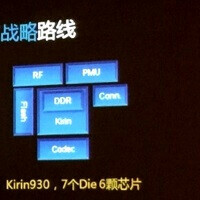 Apparently, the Kirin 930 is based on four regular Cortex A53 cores and four enhanced Cortex A53e cores. The latter appears to be a Huawei creation, and are remarkably different to the traditional Cortex A57 and Cortex A53 cores. For starters, stock A53 cores traditionally run at 1.2GHz, which doesn't cut it for flagship performance. So Huawei pushed them as hot as 2Ghz, which makes them nearly as fast as Cortex A57 cores, but more power-efficient. According to the company, A57 cores, which are about 56% faster than A53 cores, could eat up as much as 256% more electricity, which results in heat creation and reduced battery life. So Huawei made a careful compromise and ended up with slightly slower, but hopefully more power-conscious cores. A53 vs A57 vs A72 power to performance ratio comparison. Alas, we don't know what units or measurements Huawei made. You know this one. Huawei showed the Cortex A57-wielding Snapdragon 810 in the HTC One M9 as an example of serious overheating. A53 vs A57 performance comparison. We take it the A53 manages more computations for 3.5W power consumption. Then again, the comparison shows a quad-core A57 configuration, so the stakes aren't remotely even. Huawei giving the A53e some peptalk. Anyone care to translate? A53e + A53 also supports "nuclear size hybrid architecture", if Google Translate's to be trusted. Apple A8 vs Kirin 930 size and structure comparison. Huawei's SoC has a smaller footprint and frees enough space on the motherboard to fit a 300mAh battery. But how did Samsung's 20nm Exynos 5433 manage to use 4 1.9Ghz A57s and still have no overheating issues? umm Samsung is a boss lol. they put the chip in a big enough phone that could properly distributed the heat and the devices with that chip are plastic not metal. qualcomm just messed up cause there definitely not inexperienced? and metal also retains way more heat than plastic so its not that great the note 4 is one of the coolest running high end phones there is. a metal phone is more prone to overheat than a plastic one. and the size definitely make a difference. I wonder if it actually is 16nm? if compared to samsung 14nm,samsung is better? And tsmc 16nm is same with the perfomance of the 20nm? that means tsmc 16nm is only 20nm +finfet? I really liked their thinking and that's why the Honor 6 Plus heats less than the competition, even better than Note 4. Good job huawei this seems promising, I like it when company able make their own component and innovating. They wanted make it cheap. Also I don't believe it's manufactured at 16nm. They said that anywhere? It doesn't seems likely to me choosing very expensive 16nm manufacturing process while they are choosing A53 and Mali-T628 for lower cost. More importantly A53's given die size implying it's more likely 28nm. According to Anandtech, Exynos 5433's single core of A53's die area is 0.7mm2 at 20nm. We know 2GHz A53's rough performance from MT6795's Geekbench scores. Also Snapdragon 615 uses two quad core A53 cluster with Snapdragon 615. So it's not a new approach. Interesting part is about A72. We got a bit more info about it. Seems it's die area smaller than A57 and delivers more performance at same clock speed with less power consumption. Those are lame excuses for the real fact: The single threaded performance will be far away from the A57 cores. The A53 cores have more or less the same performance than then old A9. Not much better or worse. That means: worse than A15, and much worse than A57. Yes, they will produce less heat and occupy less space (saving money for Huawei) but please don't go selling then that the phones are "flagship" killers when they have that silicon on them. A53 is 2 wide in-order core A57 & A72 are 3 wide out-of-order cores. Out of order execution hardware consumes lot of power due predictive nature of implementation. Also task scheduler plays major role in efficient implementation. I don't like the idea of dis crediting A57 & A72 cores in comparison to A53. How do we know load scenario was not favorable to in order execution. I read something about the last pic that Huawei was able to integrate a base band inside the Kirin 930 by using less 'dies' compared to Apple. Thus, the higher integration density results to more power efficiency and more spaces being saved that the size is equivalent to a 300mah battery.